Change the World at Dani’s Dreams! Set up a recycling bin at your house…turn off lights that you are not using…find out about your world and share that with others – each action will Change the World! 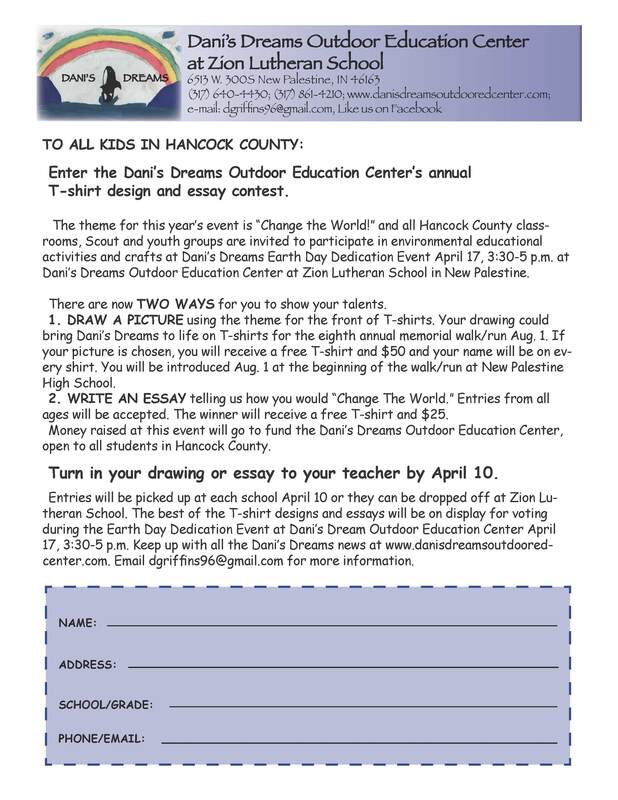 Enter the Dani’s Dreams Outdoor Education Center’s annual T-shirt design and essay contest. The theme for this year’s event is “Change The World” and all Hancock County classrooms, Scout and youth groups are invited to environmental educational activities and crafts at Dani’s Dreams Earth Day Dedication Event April 17, 3:30-5 p.m. located at Zion Lutheran School in New Palestine. There are now TWO WAYS for you to show your talents. 1. DRAW A PICTURE using the theme for the front of T-shirts. Your drawing could bring Dani’s Dreams to life on T-shirts for the eighth annual memorial walk/run Aug. 1. If your picture is chosen, you will receive a free T-shirt and $50 and your name will be on every shirt. 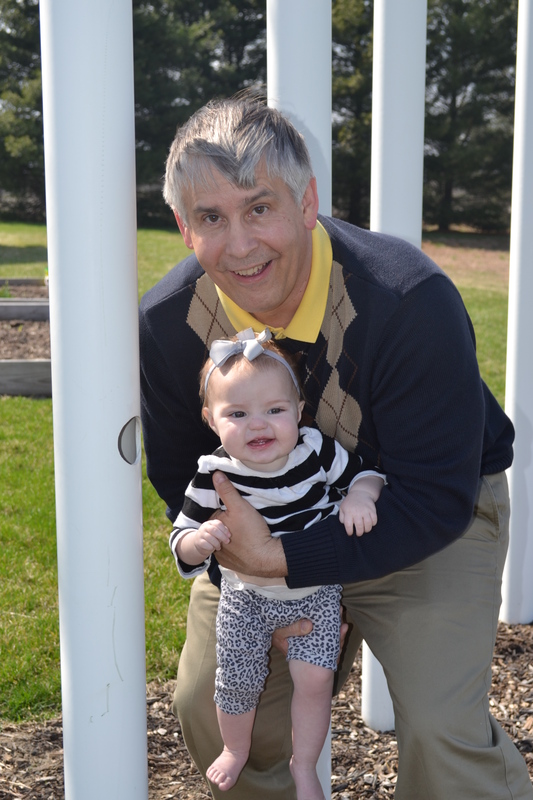 You will be introduced Aug. 1 at the beginning of the walk/run at New Palestine High School. 2. WRITE AN ESSAY based on the theme “Change the World!” Entries from all ages will be accepted. The winner will receive a free T-shirt and $25. Money raised at this event will go to fund the Dani’s Dreams Outdoor Education Center, open to all students in Hancock County. Turn in your drawing or essay to your teacher by April 10 or bring it to Dani’s Dreams April 17, 3:30-5. 1) A Nature Detective hunt, where children gathered information on butterflies, birds, dinosaurs, weather and photosynthesis. All winning names were placed in a random drawing for an I Spy birdhouse. The Day family won the birdhouse! Watch for future reports on Dani’s Dreams website and Facebook page from the Day birdhouse. 3) Thanks to the participating families who planted bulbs, one of the gardens at Dani’s Dreams will bloom this summer with colorful gladiolus flowers! 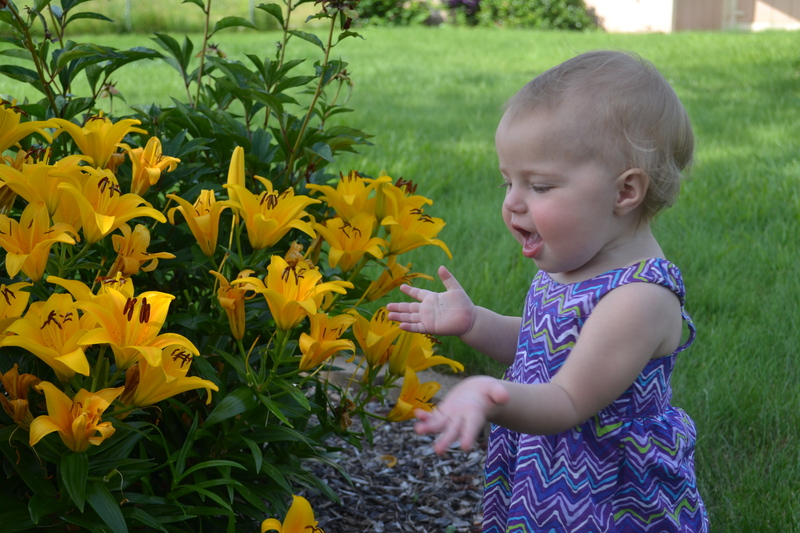 Check out the plants’ progress over the summer on the website and Facebook page. 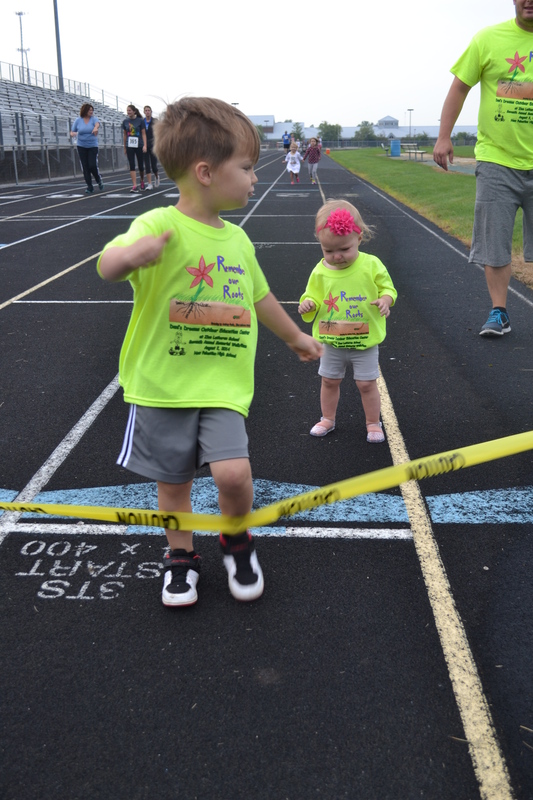 The first round of voting took place for this year’s T-shirt design and essay contest for the Dani’s Dreams Walk/Run Aug. 2, 8 a.m. at New Palestine High School. Finalists will be chosen and placed online where everyone can vote for their favorite! 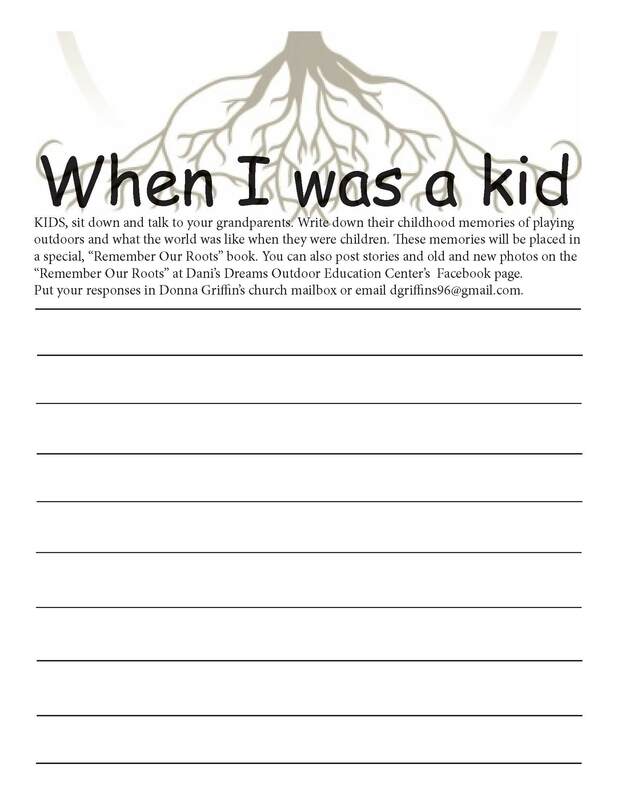 Kids, don’t forget to talk to your grandparents and get their stories for our “Remember Our Roots” memory book. We are compiling childhood memories and stories over this year. Send them to Zion Lutheran School, in c/o Dani’s Dreams or post them online at the Remember Our Roots at Dani’s Dreams Outdoor Education Center’s Facebook Page. Remember Dani’s Dreams Outdoor Education Center at Zion Lutheran School is open every day to spend some quality outdoor time with your family! Tomorrow’s “Remember Our Roots” celebration kicks off a year of activities, learning and fun at Dani’s Dreams Outdoor Education Center, with kids taking the lead and connecting to their roots – their grandparents. All grandparents and their grandchildren are invited to share their memories in the Go Green Center tomorrow, 3:30-5 p.m. either on video or by filling out the “When I Was A Kid” story form. The stories created, as well as the posts and pictures uploaded to the “Remember Our Roots” Facebook page, will be placed in a memory book for the end of the year. We’ll also be planting bulbs, constructing mini-greenhouses, gathering knowledge on a nature detective hunt and creating family tree stories about life when grandparents were children. Studies show that environmental education improves student achievement in core subject areas and also makes students more interested in learning overall. What’s more, getting kids outside and active promotes a healthy lifestyle that is essential to fighting obesity and reducing symptoms associated with attention deficit disorder, depression, and stress. And for all generations, nothing beats being outside, enjoying God’s wonderful creation, and spending precious moments with family – join us!